Although The Patient Protection and Affordable Care Act (Health Care Reform) doesn’t fully go into effect until January 2014, several elements are in place now in 2010. The additional costs to cover these current enhancements will be primarily reflected in additional insurance premiums for individuals and small business health plans. 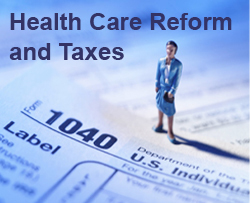 To help pay for some of the future Health care Reform costs, several subtle and little publicized tax deductions and elements of tax favored health savings accounts were eliminated or changed. Some will start to hit your tax return next year, a few of which are listed below. Another good source of info on health care tax changes can be found on this Kiplinger post. For those incurring significant medical costs, your ability to deduct these expenses will be decreased. This legislation increases the adjusted gross income threshold for claiming an itemized deduction from 7.5 percent to 10 percent. Your employer paid portion of health insurance will be included on your W2’s, but not considered income. Starting in 2011, your W-2 tax form sent by your employer will be increased to show the value of whatever health insurance you are given by the company; your gross will go up by the amount of insurance you get. Once Uncle Sam starts tracking how much is paid in insurance how long do you think it will be before health insurance premiums are taxed? You will no longer be able to use health savings account (HSA), flexible spending account (FSA), or health reimbursement (HRA) pre-tax dollars to purchase non-prescription, over-the-counter medicines (except insulin). The legislation also imposes a cap on flexible spending accounts (FSAs) of $500 (currently, there is no federal government limit). The HSA Withdrawal Tax Hike – This provision of increases the additional tax on non-medical early withdrawals from an HSA from 10 to 20 percent, disadvantaging them relative to IRAs and other tax-advantaged accounts, which remain at 10 percent. Starting in 2013, a 0.9% Medicare surtax will apply to wages in excess of $200,000 for single taxpayers and over $250,000 for married couples. Investment tax rates on high earners rates will take another hit in 2013 as for the first time investment income of households with an income of $250,000 or higher will be hit with the 3.8 percent Medicare tax. Therefore taxes on capital gains and dividends will move from 15% to a range of 23%-40% plus. It’s difficult keeping up with all the changes in store for our future, but we at Affordable Health Solutions are doing the best we can. If you have any questions or concerns as these changes unfold, please feel free to contact us. If we don’t have your answer immediately at hand, we have the resources to help. « Should You Grandfather Your Health Insurance Under the New Healthcare Reform?